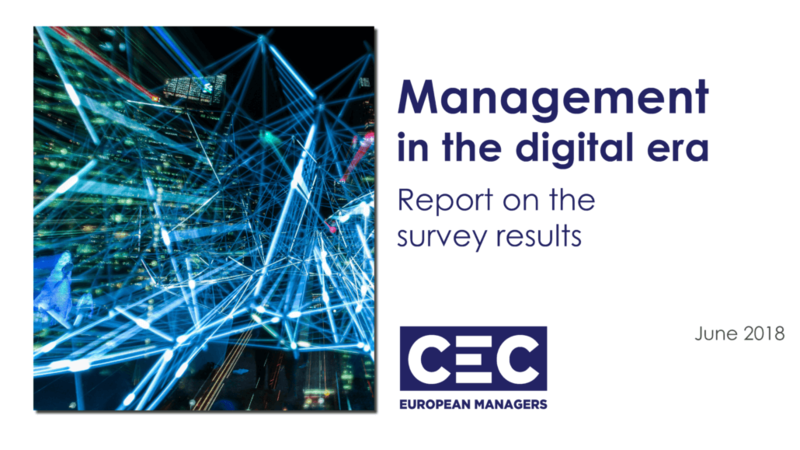 CEC European Managers has published the results of its survey on “Management in the Digital Era”, depicting the state of development of digital technologies from a managerial perspective. Please find the full report on Management in the Digital Era here. The results of the fourth edition of the European Managers’ Panel, conducted among 1400 panelists accross the continent, show that most digital technologies have left their niche existence. When it comes to the way they are put in practice, progress has to be made in the way leadership is applied for their implementation. Only then can productivity gains and better working conditions, among others, be achieved. The digital working conditions investigated point at room for improvement, especially when it comes to flexible working arrangements and accompanying employees in the digital transformation process. Finally, privacy enjoyed a particularly high attention, whereas other ethical concerns were mentioned less often. The survey highlights the need to establish real lifelong learning opportunities, to foster work-life balance and to invest in a leadership fit for the future – a call to managers and policy-makers.